Save the date! The second annual Practice-Based Teacher Education Workshop, an opportunity for teacher educators to examine and try out practice-based teacher education pedagogies in workshops facilitated by TeachingWorks will take place July 8-10, 2019 at the University of Michigan School of Education, in Ann Arbor, Michigan. The program will begin midday on July 8 and conclude in the early afternoon on July 10. Register for the program and learn more about program details and logistics here. This year, in place of field observations, we will use artifacts of practice such as videos and transcripts, creating more time for teacher educators to practice teacher education pedagogies. The workshop will take place from July 8-10, 2018 in Ann Arbor, Michigan. Lodging: A block of rooms has been reserved at Bell Tower Hotel at a rate of $199.00 per night as well as the Residence Inn Ann Arbor Downtown at a rate of $229.00 per night. Please reference TeachingWorks when reserving your room. You can reserve at the Bell Tower Hotel by calling (800) 562-3559 or by visiting their website. You can reserve at Residence Inn Ann Arbor Downtown by calling (734) 662-9999. Please book by June 8, 2019 to secure this rate. If you need more information, please feel free to call us at (734)763-8583. This workshop is intended for teacher educators interested in learning about and engaging in practice-based teacher education. The sessions will be relevant to field instructors as well as methods instructors. 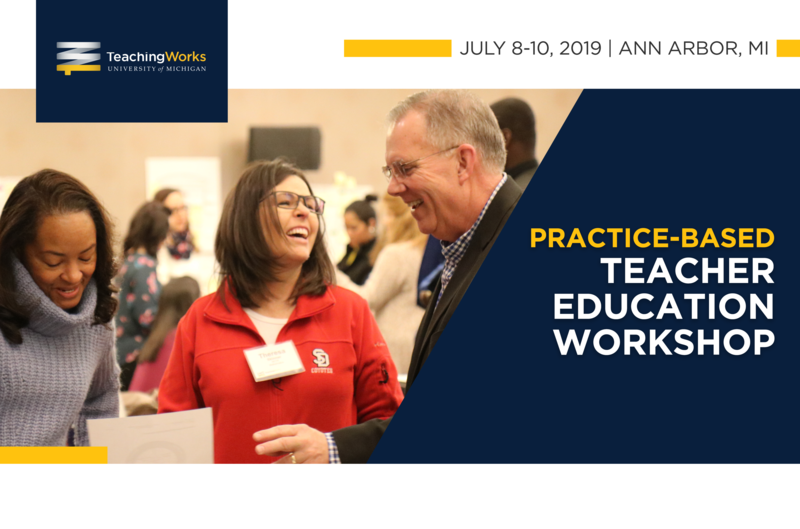 It will be designed for teacher educators new to working with TeachingWorks as well as teacher educators who have participated in previous TeachingWorks convenings including last summer's workshop.